Each bout in this weekend’s WFTDA “Championals” in Atlanta stands to be a crazy nailbiter. I am so pumped to watch all these deserving, top notch teams bring it to the track for all the glory. HOORAY, SPORTS! I know where I’ll be watching the feed – at our league’s sweet clubhouse in front of the big screen with my peeps. We’ll drink beer, do pushups whenever the announcer uses a terrible simile, and go “OHHHHHH!” when we see big hits or crazy apex jumps, just like the fans in the beergardens in Georgia. I assume all of you will be watching in a similar fashion – Superbowl Sunday style, with minimal focus on the details, and a ton of emphasis on the fun! the drama! the stories! and the terrible ads involving Captain Antik! But later…. after the tears have been cried and the trophies hoisted, the gambling earnings collected and the chips vacuumed out of the clubhouse sofa, you should go back and watch the archived game footage again. Because it turns out, you could really stand to learn some valuable stuff [I mean, beyond “holy crap those skaters are amaaazing!”]. Coaches from the more mainstream sports have been perfecting the art and science of footage analysis since the dawn of the VHS tape. As usual, we should take what they’ve learned and make it more… derby. 1. Check the game re-cap on DNN [edit for 2016 – now try Derby Central or The Apex !] or your favourite news source before you begin to analyse a bout. Unless you were taking notes the first time around (and it’s really hard to enjoy a bout if you are), you may not have noticed where the turning points took place. But with the help of our sportswriters you can tune your focus down to the key points of the game, whether it was one team getting lead jammer over and over, penalty issues, a big powerjam, or a scoring streak. Someone needs to do the legwork ahead of your viewing meetup, to identify these critical segments worth re-watching, note the time stamps, take notes, etc, and it does require an investment of time. The payoff: it will be a much more valuable use of your team’s time than just trying to watch all the way through. 2. Watch how the teams handle the game’s turning points. How does one team’s blockers take strategic advantage of greater numbers in the pack? How does the team with fewer blockers change their tactics to compensate? Maybe you’ll be able to notice how the team on a scoring streak has managed to pick apart the other team’s blockers, multiple jams in a row. 3. If there was a major lead or momentum change in the bout, can you identify what the successful team changed about their strategy or approach in order to take the lead? What other factors were in play? 4. Watch a single player. 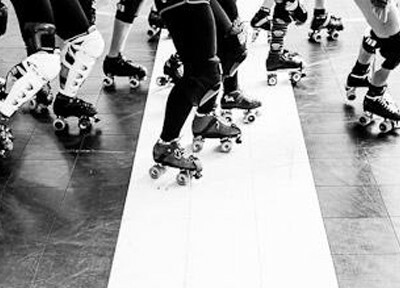 I suggest you pick a favourite blocker (even if you’re a jammer! ), and watch exactly what she does. How does she recover her position? What does she do when she’s not sitting on the other jammer? How does she position herself relative to her teammates and the track? Pick a jam where her team is dominant, and try to watch it several times over, watching the same player and analyzing her every move. What is she doing well? What did she miss? 5. Watch the same jam a few more times, and follow a player from the team that lost the jam instead. What could she have done differently? What prevented her from being more successful? Write these notes down as well. 6. After you’ve spent some time watching blockers, then allow yourself to follow a jammer through a few jams. What are her secrets to getting through? As a blocker, what would you need to do to shut her down? 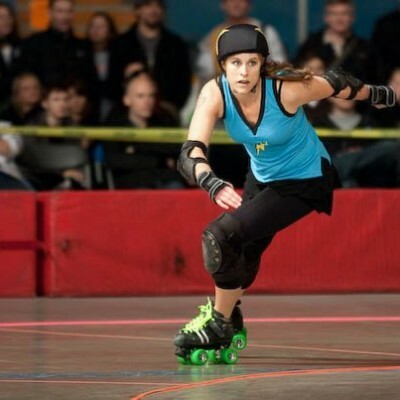 As a jammer, what can you learn from her choice of ‘line’ through the pack? 7. When does each team choose to take time outs or official reviews? As a coach, what do you learn from their strategy here? Do they call a time out when they’re ahead, behind, about to start a powerjam, or just looking tired? What happens next – are they successful in the next jam or two? In other words, do you think their time out was well-spent? 8. Overall, you should be able to identify the key strength and key weakness for each team at the end of your review, as well as their preferred blocker formation (3-wall at the front, 4-wall at the back, etc.) Pretend you’re going to write up the bout recap for the news – what made the difference? If you were coaching the losing team, what would you try to do differently next time? These focus points for analyzing bout footage apply whether you’re watching the best in the world duke it out, or whether you’re picking apart your competition for next weekend. 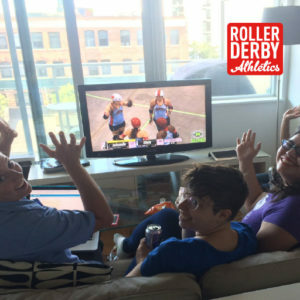 Now that you know how to pick apart the game… are you strong enough to watch footage of yourself?! Fold 1: Have a blast this weekend watching the games without doing too much analysis! Fold 2: tell me in the comments below what is the #1 thing you’ve learned from watching bout footage in the past? Thank you so much for posting this! I have been wanting something that will help me glean more from watching bout footage!